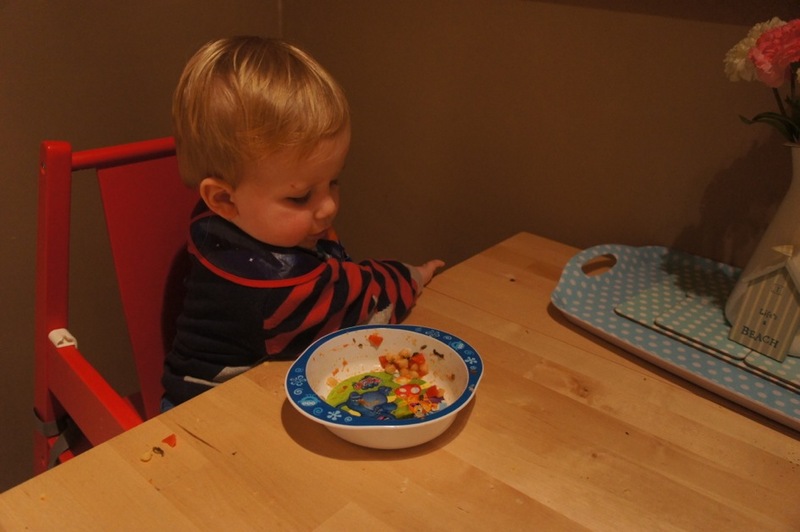 Nuby recently asked us if we’d give their new i Monster feeding set a go. It doesn’t have all the bells and whistles of the old set (which was the prize on the Mum’s Days facebook scary photo competition this week), there’s no funny feeding pots, this is your old fashioned malamite feeding bowl, plate and stainless steel knife, fork and spoon set. I have to say that I kind of like the fact that it’s simple. I love the novelty of the original set but since when did cutlery have to be the main attraction? Surely the beautiful food I create is good enough?! 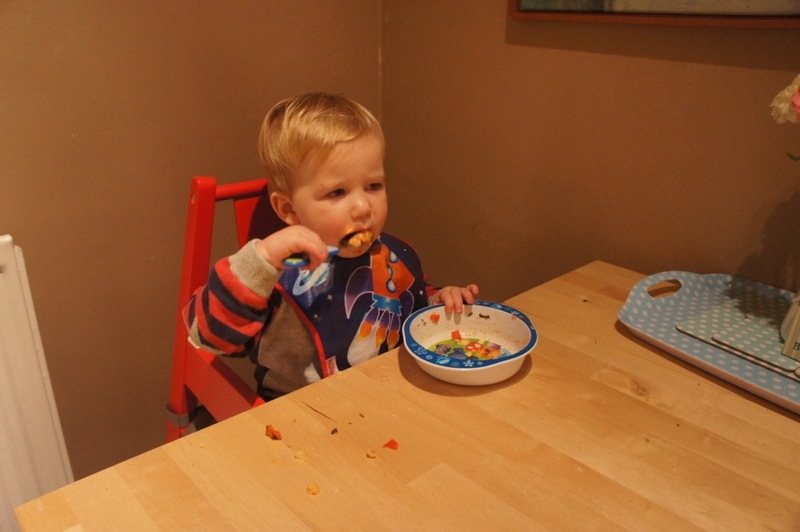 I say that entirely tongue in cheek, of course, because Reubs has gone through a fairly long phase now of hating most things I give him so any distraction with cutlery is very welcome! 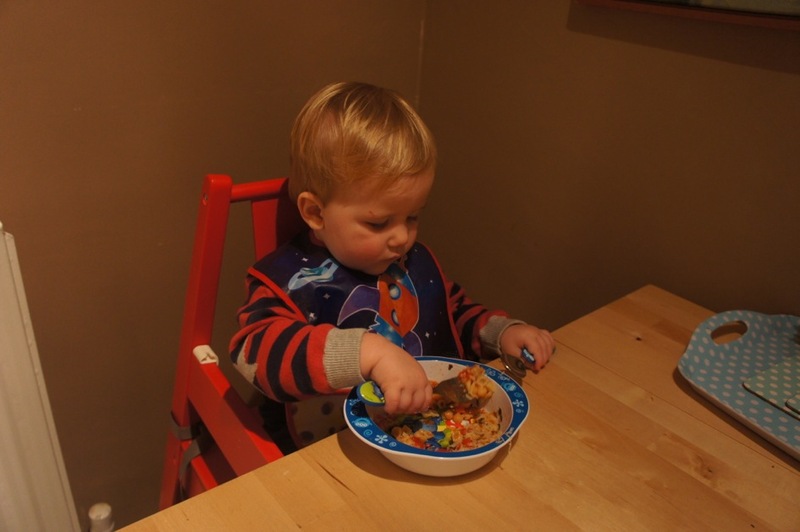 But he seems to like the “big boy” cutlery of the i Monster feeding set and likes to look at the design on the plate once he’s “finished” and goes “rawwww”, which is insanely cute. Originally I had thought that forks were a bit dangerous. That maybe he would poke himself in the eye or mouth and hurt himself. It turns out that he likes stabbing things, like a chunk of scrambled eggs, with a fork and I now use a fork over a spoon for him. 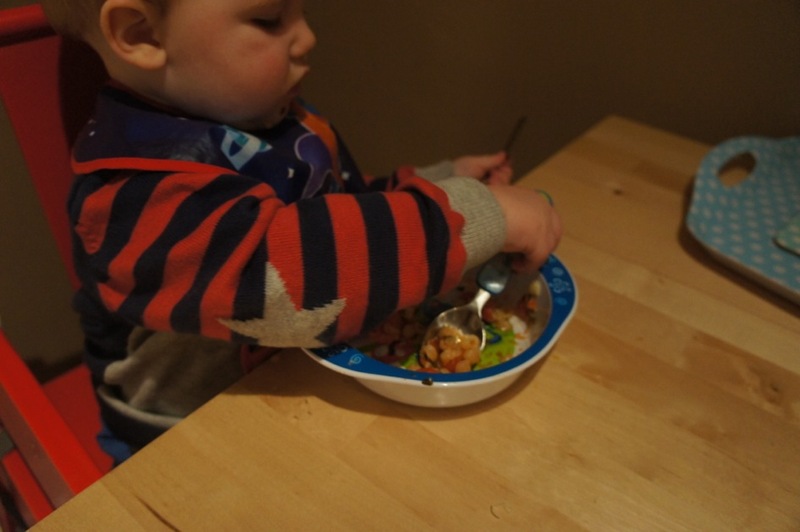 I also read in the Baby Led Weaning book I mentioned yesterday, that when babies are first learning to use cutlery, you might want to consider using a fork. It increases the chance of your baby getting something into its mouth as they can scoop and stab. Genius. Just before he came out in the pox Reubs ate really well for 2 days and it was during these 2 days that I managed to get some lovely shots of him ACTUALLY EATING AT THE TABLE! Amazing*. 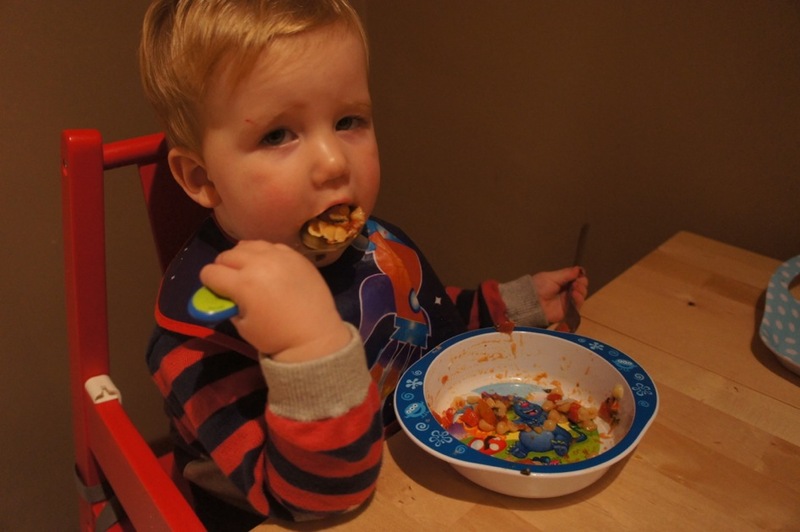 You can see here that he’s managed to get quite a good scoop of pasta on his fork and actually managed to get some of it to his mouth! 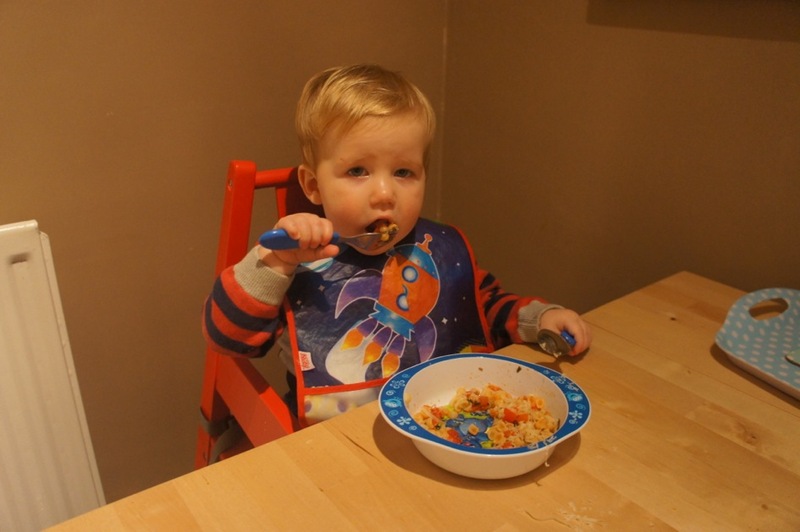 As a rule, the spoon in his left hand is pretty redundant, so I have a second spoon in the waiting. 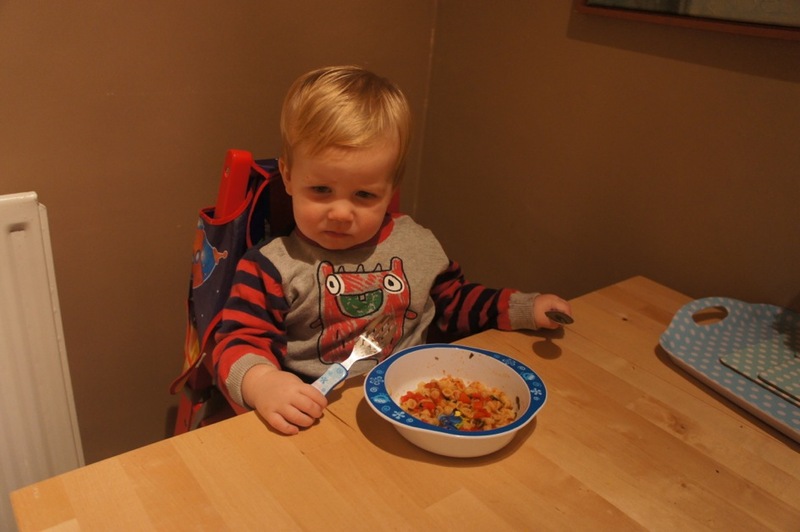 To give him a little helping hand when there’s less in the bowl I’ll sneakily load the spoon for him. In this instance I had loaded it pointing to the left so he could use his left hand. He decided he’d use his right anyway. 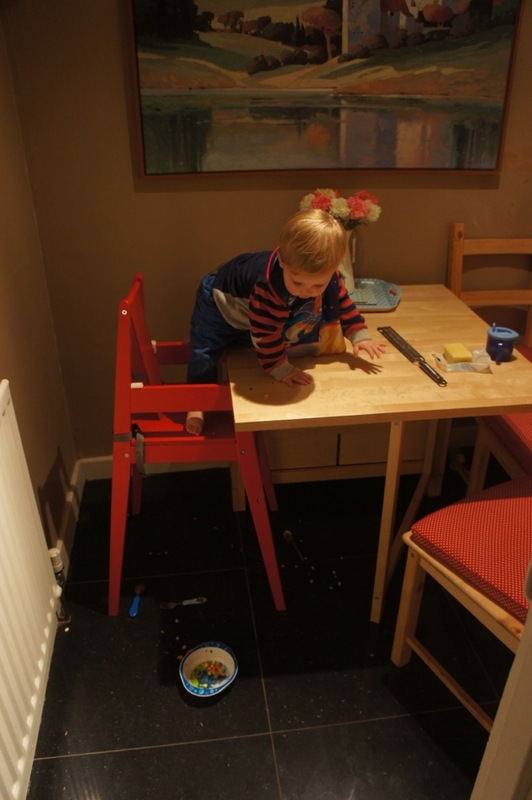 Then when he’s starting to think about being finished he’ll kindly put his cutlery on the floor. 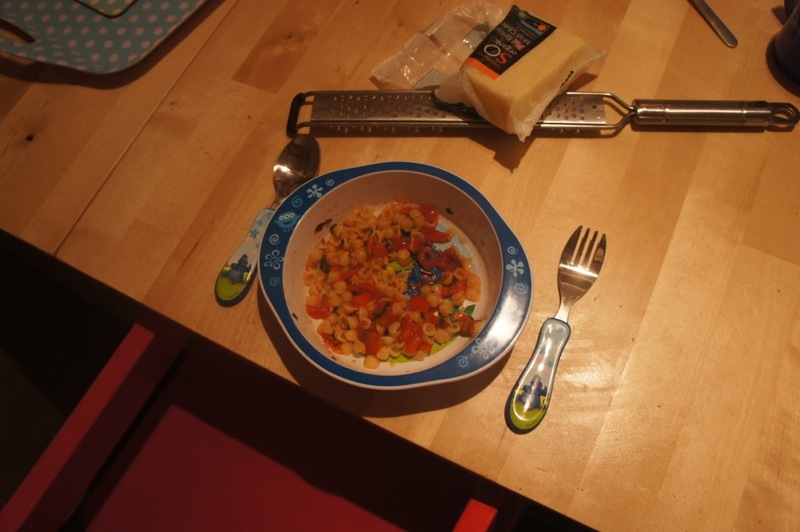 But being the persistent mum I am I retrieve the cutlery and have one more go, this never normally works but look! Go on but then I’m really finished! It’s OK, I’ll just get myself down. 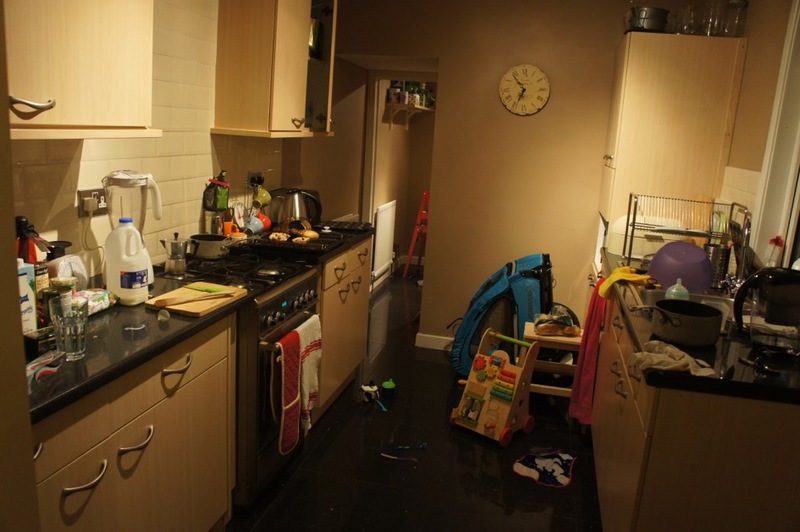 This doesn’t actually demonstrate the true carnage, but it gives you a bit of an idea! 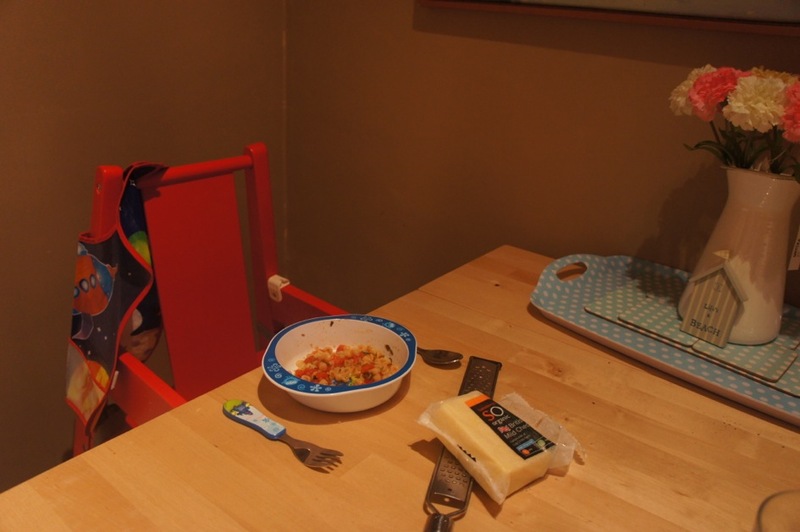 How do you engage your little one at meal times? 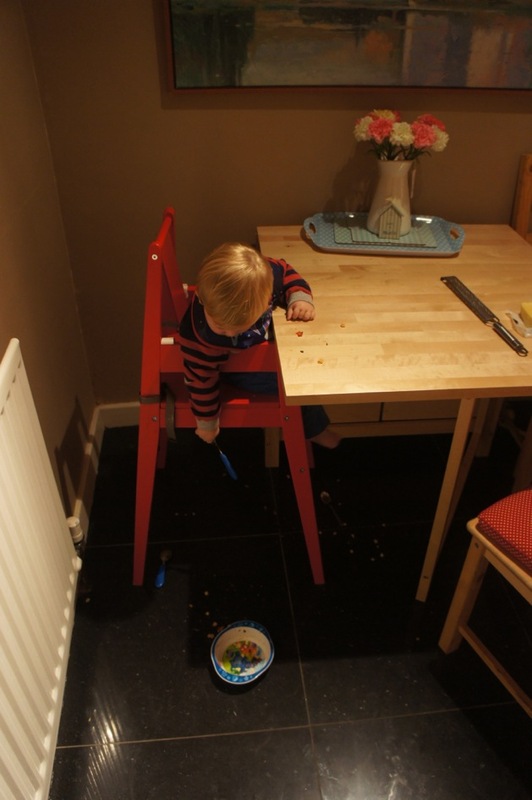 Reuben’s latest eating trick is to have about 3 bites of food and start attempting to climb out before swallowing said 3rd bite. So before I’ve even sat down to start my food he’s lost interest and is off. Some people would say strap him in (which is mainly pointless as he can contort himself out) but that would result in a very unenjoyable mealtime for all. Or would you just let him down, assuming it’s ‘just a phase’ (he’s 15 months)? 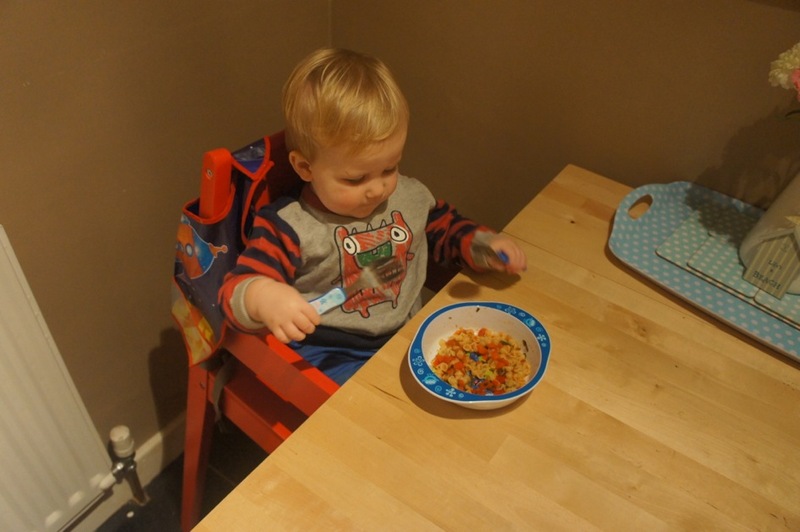 The suggestions were to move him out of a highchair to either a booster seat or a little table and chair set of his own – awww! – or to use a Fun Pod so he can stand (see what the Mum’s Net lot thought here)…I had no idea what that was, Maxeen! !